Inherited by: Q3Frame, Q3ProgressBar, QAbstractScrollArea, QLabel, QLCDNumber, QSplitter, QStackedWidget, and QToolBox. The QFrame class is the base class of widgets that can have a frame. QMenu uses this to "raise" the menu above the surrounding screen. QProgressBar has a "sunken" look. QLabel has a flat look. The frames of widgets like these can be changed. The QFrame class can also be used directly for creating simple placeholder frames without any contents. The frame style is specified by a frame shape and a shadow style that is used to visually separate the frame from surrounding widgets. These properties can be set together using the setFrameStyle() function and read with frameStyle(). The frame shapes are NoFrame, Box, Panel, StyledPanel, HLine and VLine; the shadow styles are Plain, Raised and Sunken. A frame widget has three attributes that describe the thickness of the border: lineWidth, midLineWidth, and frameWidth. The line width is the width of the frame border. It can be modified to customize the frame's appearance. The mid-line width specifies the width of an extra line in the middle of the frame, which uses a third color to obtain a special 3D effect. Notice that a mid-line is only drawn for Box, HLine and VLine frames that are raised or sunken. The frame width is determined by the frame style, and the frameWidth() function is used to obtain the value defined for the style used. The margin between the frame and the contents of the frame can be customized with the QWidget::setContentsMargins() function. This enum type defines the types of shadow that are used to give a 3D effect to frames. 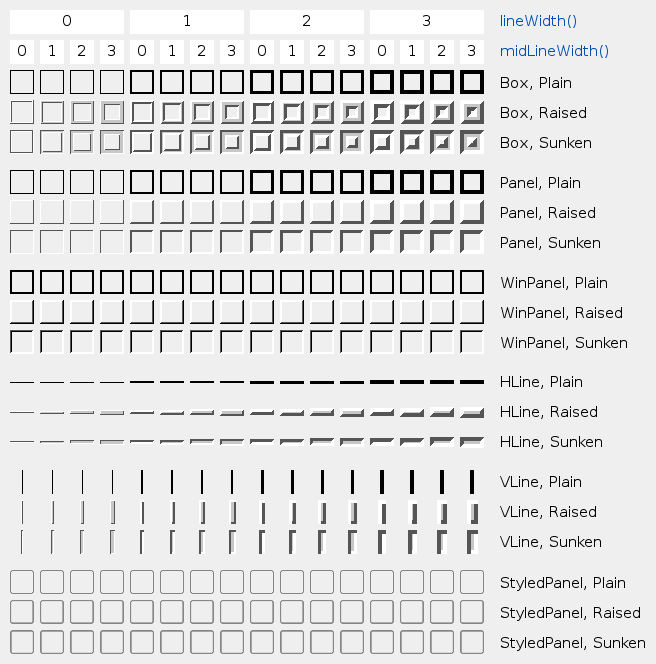 Shadow interacts with QFrame::Shape, the lineWidth() and the midLineWidth(). See the picture of the frames in the main class documentation. See also QFrame::Shape, lineWidth(), and midLineWidth(). This enum type defines the shapes of frame available. QFrame::StyledPanel 0x0006 draws a rectangular panel with a look that depends on the current GUI style. It can be raised or sunken. QFrame::WinPanel 0x0003 draws a rectangular panel that can be raised or sunken like those in Windows 2000. Specifying this shape sets the line width to 2 pixels. WinPanel is provided for compatibility. For GUI style independence we recommend using StyledPanel instead. When it does not call QStyle, Shape interacts with QFrame::Shadow, the lineWidth() and the midLineWidth() to create the total result. See the picture of the frames in the main class documentation. See also QFrame::Shadow, QFrame::style(), and QStyle::drawPrimitive(). Normally, you don't need to use these, since frameShadow() and frameShape() already extract the Shadow and the Shape parts of frameStyle(). See also frameStyle() and setFrameStyle(). This property holds the frame's rectangle. The frame's rectangle is the rectangle the frame is drawn in. By default, this is the entire widget. Setting the rectangle does does not cause a widget update. The frame rectangle is automatically adjusted when the widget changes size. If you set the rectangle to a null rectangle (for example, QRect(0, 0, 0, 0)), then the resulting frame rectangle is equivalent to the widget rectangle. This property holds the frame shadow value from the frame style. See also frameStyle() and frameShape(). This property holds the frame shape value from the frame style. See also frameStyle() and frameShadow(). This property holds the width of the frame that is drawn. Note that the frame width depends on the frame style, not only the line width and the mid-line width. For example, the style specified by NoFrame always has a frame width of 0, whereas the style Panel has a frame width equivalent to the line width. See also lineWidth(), midLineWidth(), and frameStyle(). This property holds the line width. Note that the total line width for frames used as separators (HLine and VLine) is specified by frameWidth. Значение по умолчанию равно 1. See also midLineWidth and frameWidth. This property holds the width of the mid-line. Значение по умолчанию равно 0. See also lineWidth and frameWidth. Constructs a frame widget with frame style NoFrame and a 1-pixel frame width. The parent and f arguments are passed to the QWidget constructor. The default value is QFrame::Plain. See also setFrameStyle(), frameShape(), and frameShadow(). Sets the frame style to style. The style is the bitwise OR between a frame shape and a frame shadow style. See the picture of the frames in the main class documentation. The frame shapes are given in QFrame::Shape and the shadow styles in QFrame::Shadow. If a mid-line width greater than 0 is specified, an additional line is drawn for Raised or Sunken Box, HLine, and VLine frames. The mid-color of the current color group is used for drawing middle lines.